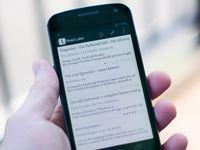 The popular reader app, Instapaper has finally been released for Android. The software is very popular among iPhone users, so it is expected to be equally popular on Google's platform. The app allows you to save web-pages for offline viewing. This means you can grab your favourite online stories when at home, and read them while commuting. To optimise readability, it removes images and other distractions from the content. Instapaper's clean UI resembles to that of the e-book readers. It provides adjustable fonts, text sizes, and line spacings options to suit your needs. Brightness controls are available, and you can also choose between light and dark backgrounds. The app is compatible with devices running Froyo and above, and is priced at Rs 170.